This summer, help your child unleash his/her star potential at the Promil Pre-School i-Shine Talent Camp! Kids all over the country will be getting their chance to shine and be discovered as the Promil Pre-School i-Shine Talent Camp begins its search for the brightest star with a grand kick-off at the SM Mall of Asia Music Hall from April 9-10. It will be a whole day of singing, dancing and acting workshops designed to nurture the star potential in each child. These workshops will be led by the country’s leading talent schools: Center for Pop, The Regine Tolentino Dance Studio, and Trumpets Playshop. What’s more, kids who shine at the Promil Pre-School i-Shine Talent Camp will be given a chance to become part of GMA’s newest TV talent search, as each workshop will serve as an audition to Promil Pre-School i-Shine Talent Camp TV! The big winner of this talent search will get P200,000 (tax-free) plus a contract with the GMA Artist Center! To join, simply accompany your kids, ages 4 to 7 years old, to the Promil Pre-School i-Shine Talent Camp, fill up the registration form, and submit the following requirements: child’s birth certificate, 2 valid IDs of the parent/guardian, parent’s written consent (if the companion is not the child’s parent), and a proof of purchase receipt of Promil Pre-School (any size) dated January 1, 2011 onwards. You can also register online at http://www.ishine.com.ph. The search for the next big talent will also go nationwide as the Promil Pre-School i-Shine Talent Camp visits SM Cebu on April 15-16, SM Rosales (Dagupan) on April 27-28, and SM Davao on May 2-3. So what are you waiting for? Nurture your child’s talent and uncover his star potential at the Promil Pre-School i-Shine Talent Camp! Who knows, he could be the country’s next shining star! 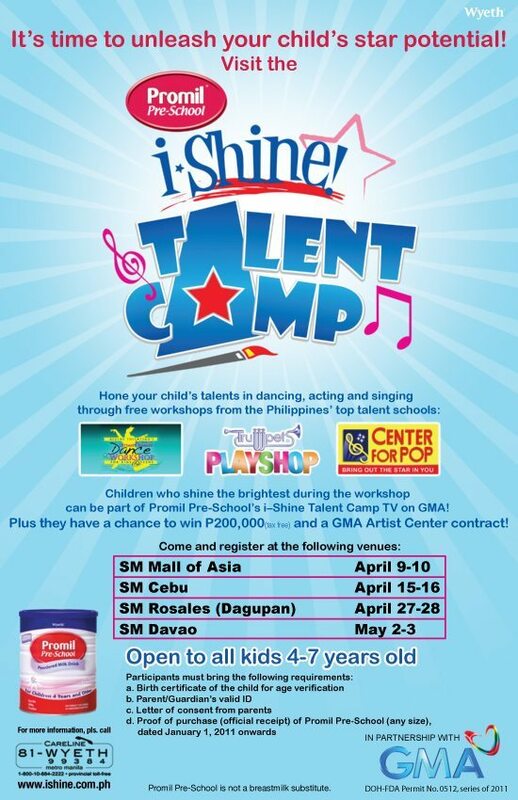 The Promil Pre-School i-Shine Talent Camp is brought to you by GMA Network Inc., and Promil Pre-School. Promil Pre-School, a powdered milk drink for children 4-7 years old, partners and supports all parents in developing their child’s talents. It contains Nutrissentials – a unique combination of essential nutrients to help optimize a child’s full potential. For inquires, please call the Wyeth Careline at 81-WYETH (99384) or the provincial toll-free number 1-800-10-884-2222. Years from now, I will let my Baby Keisha join contests like this. I want her to discover her potentials in music and in acting and become a celebrity in her own way. My three kids are all promil babies. I also recommend promil to my sister. puwede p b ako d2? wala po bang sta. lucia mall pra malapit? Excited na po ako, Davao search… puwede po ba ako taga South Cotabato? my son is only 3 yrs. old..pwede n rin b xa mg-audition?